Masks are very useful to the skin. They help to remove impurities, clean out the pores, and get rid of acne blemishes, as well as heal them. 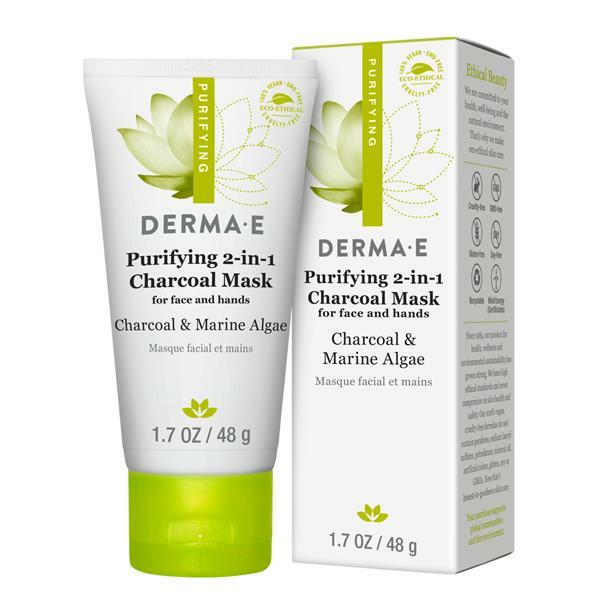 DERMA E has the perfect mask for those with oily or acneic skins, or for those who need to detoxify their skin, called the Purifying 2-in-1 Charcoal Mask. The Purifying 2-in-1 Charcoal Mask deeply detoxifies skin of harmful micropollutants in two ways: (1) Natural clays infused with Kimarine® Wakame, Bladderwrack and Activated Charcoal lift out dirt, oil and bacteria to decongest pores as the mask dries; (2) Apricot Seed Powder exfoliates away dead skin cells and captured debris when removed. Kaolin and Bentonite Clays absorb excess oils and impurities, relieving skin congestion (blackheads and other blemishes). Kimarine® Wakame is a potassium-rich, magnesium-rich seaweed that has been clinically proven to protect skin against environmental pollutants (exhaust fumes, cigarette smoke, heavy metals). Bladderwrack is an antioxidant-rich, mineral-rich seaweed known for its water-binding properties, supporting healthy skin hydration and nourishment. Activated Charcoal, known for absorbing 100 to 200 times its weight in impurities, purges pores of deeply rooted toxins. Apricot Seed Powder gently exfoliates away micropollutants. This mask is ideal for oily, active or urban skin types, and is even safe for reactive/sensitive skin types (minimal ingredients and allergy-tested), use this formula once or twice a week for skin that looks dramatically fresher, healthier and purely glowing. To Use: Apply generously to clean face, avoiding eye and lips areas. Leave on for 5 minutes or until mask is dry. Moisten fingertips then massage gently in a circular moisten to activate exfoliants. Concentrate on areas of congestion, such as nose, chin and forehead. Rinse thoroughly or remove with a wet cloth. Pat dry. Use 1-2 times a week for oily or acneic skins, 1 time a week for drier skins or reactive skins. After using the mask your face will feel soft, clean and visibly better. Skin will be pink and the blood flow to your face will have increased significantly for a little while. Skin will be healing itself and getting rid of all the impurities in the pores. It is nice that it is a 2-in-1 mask since having the mask and the exfoliation in 1 helps it do double duty. The mask alone just gets rid of impurities but with the exfoliation it helps to allow skincare to penetrate the skin better, use this at night to have acne medicine help blemishes easier. Your skin will be at its peak performance right after using the mask. 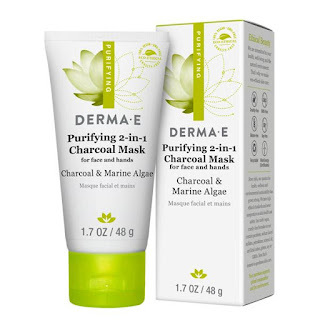 DERMA E Purifying 2-in-1 Charcoal Mask retails for $19.50 and can be purchased from www.dermae.com or in many stores across the United States, such as Whole Foods, Target, CVS and Sally Beauty Supply. Go to the store locator to find Derma E near you: http://dermae.com/locations.html. Like Derma E on Facebook:https://www.facebook.com/dermaenaturalskincare; Follow Derma E on Twitter: @derma_e; Subscribe to Derma E on YouTube:https://www.youtube.com/user/DermaEBodycare; Follow Derma E on Instagram:http://instagram.com/dermae# and Follow Derma E on Pinterest:http://www.pinterest.com/dermae/.